System-wide transparency across your supply chain tailored for your distinct processes. Each manufacturing business is unique with different products, people, and varying business processes. 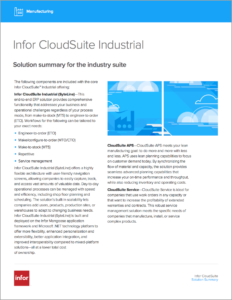 The Infor CloudSuite™ Industrial solutions is designed to be inclusive and wide-ranging in its possibilities, yet precise and specific to any manufacturing organization. With flexible and personalize-able modules, your ERP system can be tailored to meet your exact business needs while enabling you to scale your business for growth and expanding customer demands.